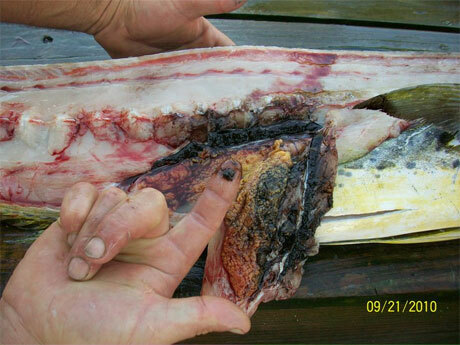 Meanwhile, the picture below, said to be of a fish recently caught in the Gulf of Mexico off Florida. Very useful debate between Andrew Dessler and Richard Lindzen. Warning to liberal arts majors. It’s long, and there are numbers. I’ll be rewatching this one a lot. I’m not a big meat eater, but I’m not a pure vegetarian. My organic farming son has taught me a lot about sustainable, free range meat and dairy, and the difference between store bought and fresh, local meat and eggs. (it’s vast) Here’s some representatives from my son’s generation of farmers. In the newly released Arctic Ice Report Card, a panel of leading experts on northern ice report on the continued acceleration of ice melt on the Greenland cap. According to Konrad Steffen, one of the world’s most respected experts on the topic, this has already become the warmest year on record in Greenland, where temperature instrumental records date back to 1750. Steffen notes that, while recent statistical modeling has projected maximum sea level rise due to ice cap melt might be 1 or 2 meters this century, those models have not yet been able to reproduce the glacial movement that is already being observed on places like Jacobshavn glacier, Greenland’s largest. The official website of Denmark quotes Jason Box of Ohio State University, who says, “It is my assessment that we have had the strongest melting since they started measuring the temperature in Greenland in 1873..” and sums up the the most recent observations of melting thusly, “The Danish research scientist Sebastian Mernild of Los Alamos National Laboratory in the US told national daily newspaper Jyllands-Posten that his calculations show that 540 cubic kilometres of inland ice, weighing approx. 500 gigatons, have melted this summer, which is 25-50% more than in a typical year”. In a video that’s been widely posted on business and green sites around the net, a Cal State-LA student leader, Joel Francis, who is a Marine Corps veteran, former student body president, and a former debate team member, has challenged Koch Industries CEO Charles Koch to a debate on Koch’s funding of California’s anti-clean energy initiative, Prop. 23. Proposition 23 is aimed squarely at destroying the most effective state-level actions on climate change and renewable energy, California’s AB 32. The Koch’s, representing their own oil interests, the climate denial community, and all things ignorant, evil and monstrous in general, of course, are pouring money into the state in this attempt to squash anyone that dares to challenge the supremacy of oil, oil money, and fossil fuel dependency. Joel Francis is calling them out, and is on his way to Kansas to deliver a challenge letter to Koch’s office on tuesday. Koch has beefed up security. Stay tuned.